This is the new popular story. In short, MIT Media Lab claims to capture video at 1012 fps. Here is a video describing the set up. Really, I wasn’t going to write about this. I figured someone like Tom (Swans on Tea) would point out the problems with this “camera”. Oh well, I guess it is up to me. This is not really one trillion frames per second. Instead, this is more like a strobe effect. You have seen this, right? You know, you take a strobe light and shin it on a guitar string or something. If you get the frequency of the light just right, it will show images of the string at different positions during it’s oscillation. In the end, you get a video that looks like it is slow motion but it isn’t. Actually, with the strobe light you can see this in real life without even using a camera. In this trillion fps camera, the light is just like a strobe light. It uses a pulsed laser. I can’t find the actual comment, but someone on reddit posted a link to this useful video showing the strobe effect with water drops. With this MIT setup, you can make cool videos but it isn’t one trillion fps. You can’t measure the speed of light with this, since you need to know the speed of light to set this up. You can’t look at a bullet colliding with a wall, because this only looks at scenes that don’t change. I hate to be the party crasher here. This makes my ears hurt. Not just because he is abusing the photon model here. Not just because you could just talk about light in terms of EM waves. No, the thing that really gets me is that you could see light passing. No. This is very non-right. Of course this model of seeing might make sense, but it is wrong. Stuff doesn’t come out of our eyes to see. Instead, light has to enter your eye to see. That is how our eyes work. So, if you really did have a one trillion fps camera you couldn’t see light go by. You could see light getting into the camera. You could see light reflecting off the object at different points, but you aren’t seeing the light as though it were a stream of water rushing by. That is just wrong. 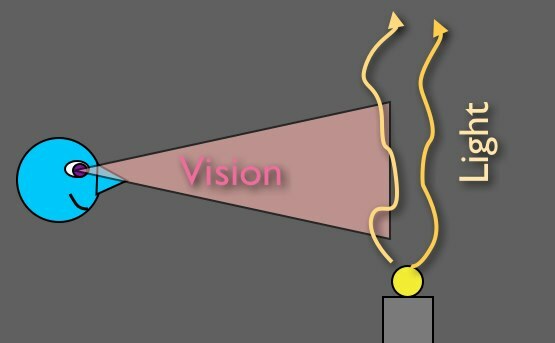 If you want to carry around this “vision coming out of your eyes” model of seeing, that is fine. Just don’t put that in an MIT video, that is not so good.